Invisibility cloaks aren’t just for Harry Potter anymore. Imagine bending light, redirecting sound waves, or making an object invisible with the flip of a switch. It sounds like a trick out of an H.G. Wells book, or maybe the wizarding world of Harry Potter. But to UT’s Andrea Alù, it’s just another day studying metamaterials. Alù, an electrical engineer, is one of the world’s leading researchers in the field of metamaterials. While their name inspires thoughts of comic-book science, metamaterials are made up of the same chemical elements as “regular” materials. It’s their carefully designed structures, manipulated down to the atomic level, that bestow their exotic and often never-before-seen properties, like redirecting sound waves or computing complex mathematics using only light. With these metamaterials, Alù isn’t so much breaking the laws of nature. He’s just trying to bend them. Alù is tall and thin, with a mop of blonde hair and a soft voice embellished by the accent of his native Rome. His boyish disposition and shy energy don’t necessarily match the typical image of a prestigious electrical engineering professor, especially one who has contributed to several books, written nearly 600 scientific papers, held seven patents, and even graced the stage of TEDxAustin—all before his 36th birthday. He was trained as an engineer, but now relishes the multidisciplinary nature of his work, mixing physics, nanotechnology, materials chemistry, and electrical engineering on a daily basis. It’s fitting that UT has established itself as a leader in this cutting-edge field. In fact, the term “metamaterial” was coined here by now-retired engineering professor Rodger Walser in 2001, and over the past several years, Alù and his colleagues have been busy. In 2012, Alù’s team built a device that used metamaterials to make an object invisible to microwaves. Microwaves are a form of radiation with a longer wavelength than visible light, but they operate under the same laws of physics as the waves we see every day. Normally, we see something because it reflects or scatters light back into our eyes. But instead of just reflecting light, some materials, even natural ones, can bend it, like how a straw in a glass of water can appear jagged when viewed from certain angles. The metamaterials Alù designed bend light in a very peculiar way, so that, if a person were standing behind the object and looking toward it (assuming they could see microwave radiation), it would appear as if nothing were there at all. But those early metamaterial cloaks also highlighted several technological limitations. Besides being rather heavy, they limit the invisibility to a very narrow range of wavelengths. To make things worse, the cloaked object’s visibility may actually increase in other wavelength ranges. Late last year, Alù’s team announced an improved design for its microwave invisibility cloak. By using small circuits and amplifiers powered by common batteries instead of the bulky, passive materials of older designs, the next-generation cloak promises to be smaller and operate over a wider range of wavelengths. 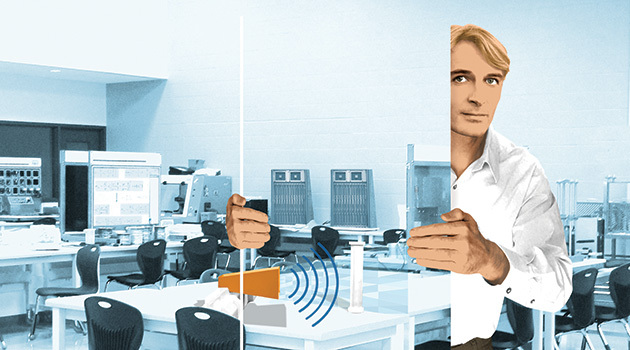 Alù thinks these devices could revolutionize wireless communications. Not only do we use microwaves to pop popcorn, but they are also the basis of our mobile phone and Wi-Fi networks. As our electronics-saturated world becomes more and more crowded with antennas, it gets harder to keep them from interfering with one another. Antenna shielding devices exist today, but they rely on rare-Earth magnets, which are becoming increasingly hard to mine and whose raw materials often lie beneath the soil of politically volatile nations. Telecommunications companies aren’t the only ones keeping an eye on cloaking technologies. Alù’s work has also caught the eye of the military, which sees a future for metamaterials in applications ranging from radar and stealth technology to sound isolation. While these invisibility cloaks certainly aren’t as magical as those concealing young wizards at Hogwarts, Alù says that visible light cloaking uses the same principles of physics, and if they can continue to develop thinner and more advanced metamaterials, capable of bending shorter wavelengths of light, he believes even that bit of imagination could become reality. Metamaterials can also solve math problems. Alù recently released a design for an analog computer constructed from thin layers of metamaterials. From the days of the abacus, early computers were, by necessity, analog rather than digital, relying on physical inputs rather than electronic ones and zeroes. The atoms within their new, theoretical optical computer are arranged in such a way that they are able to do complex math simply by manipulating light waves. Complicated image processing calculations, such as finding the edges of an object, can be done instantly, using the light of the image itself. This is a feat that, as any Photoshop user knows, can test even the beefiest of digital microprocessors.